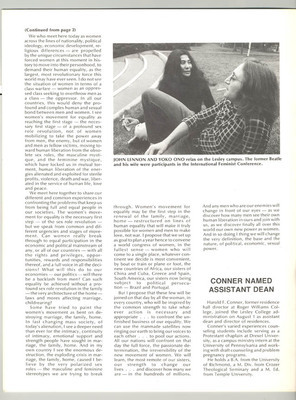 Page 6 of the July-August 1973 Current, featuring a photograph of John Lennon and Yoko Ono sitting by the amphitheater in the quad with the caption, John Lennon and Yoko Ono relax on the Lesley campus. The former Beatle and his wife were participants in the International Feminist Conference. It is from an article, titled, Betty Friedan Speaks at Lesley.